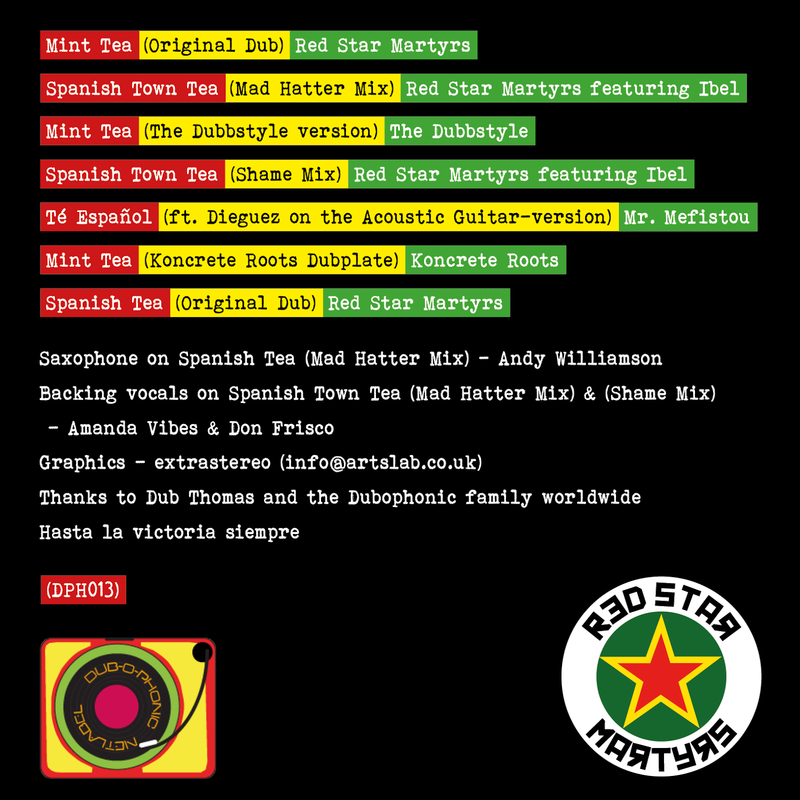 The Red Star Martyrs return with the 2nd EP on Dubophonic. This time the UK musician and producer Stanley Wood unleashes the herbal energy of tea, brewing some special blends, mixing the finest musical flavours of Europe, Jamaica, Orient and Occident in a tasty and relaxing chill out drink. Alongside with him, many artists from the Dubophonic netlabel family. Ibel, The Dubbstyle, Mr Mefistou and Koncrete Roots prepared their own special recipes and are ready to serve their exclusive versions of Stanley’s riddim. So, sip your cup and let the journey begin. The EP starts with the taste of mint in our mouth, as the oriental vibes flow inna mystical way in the atmosphere. The river of tranquility passes right in front of us, as we embark in a journey, that sets our mind and soul in a perfect balance. The magical voice of Ibel guides us ina Rub-a-dub journey of irieness, as he prepares his special Jamaican blend of tea, served in two different mixes. ………………………… The sounds of the far east travel to Argentina where mint receives a special treatment by the Dubbstyle, being mixed with the yerba mate leaves, only to be transformed into a antioxidant and cholesterol-lowering beverage, cleansing the body from all Babylon diseases. The logical outcome is the cleansing also of the mind and Mr Mefistou uses his double ethnic background and adds for the next recipe a touch of flamenco style guitar mixed with a New York influenced sound. Finally our herbal beverage returns back to the country it started its journey, only to be chilled in the fridge and to be served with ice by the Koncrete Roots inna special dubplate style. Once we are cleansed, in body and in spirit, we can enjoy the last cup of tea served exactly at five o’clock by Stanley Wood himself. Give thanks for that wonderful journey! It all started a few years ago in Argentina in the “Lavadero Records Dub Temple” when some childhood friends were sharing their passion for “di roots & kulcha music” and exploring the dub sounds and the Jamaican tradition. Past, present and future are represented in their sounds. Analogue vibes meets the new waves of dub vibrations of the 21century. After some time they moved to another place called “Cuca Roots” where they recorded some dubplates included in this album (Dubophonic head special, More dub, Another dub in the guetto) and now they are building a new studio called “El fuerte dub foundation”. All members of Negritage, William, Nacho, Leo, Pato and Herno have played together since childhood and are still play together almost every weekend, continuing their musical journey, helping each other to record the instruments for the tracks. Negritage’s gear is whatever is available, some time analogs other times digitals, mixer consoles for the overdubbers, a turntable for the vocal samples, sometimes a Kawai drum machine from the eighties.